The process of examining data related to any Supreme Court conference before the conference actually takes place is dynamic. Moving pieces are constantly shifting, mostly in the form of actors, arguments and case filings. Because the CertPool data looks at the Supreme Court dockets, the information included depends on when CertPool pulled the data. This post should therefore not be viewed as a complete analysis of what will be reviewed during the long conference, but rather as a snapshot of some of the key cases and players. This information is meant to give a sense of what the justices and clerks will review and which cases seem particularly salient at the cert stage. Looking back across the last several terms, the Supreme Court granted nine petitions from the batch reviewed at the long conference last term, 11 the previous term, and 12 the term before that. (A prior post on Empirical SCOTUS featured a closer analysis of the timing dynamics behind when the justices’ grant petitions.) This high number of single-day grants often comprises a nontrivial portion of the court’s merits docket for the term. Many of the petitions examined in the long conference are filed in-forma pauperis, meaning that the petitioners lack the necessary funds for litigation (here’s an example). These petitions have a significantly lower likelihood of success than paid petitions and are most often written for incarcerated inmates. Inmates’ petitions tend to name either the state of incarceration (or the United States) or a state officer as the opposing party. Many of these petitions are written by the inmates themselves rather than by licensed attorneys. Petitions written by the litigating party are known as pro-se petitions. To get a sense of the extent to which such petitions dominate the case list at the long conference, the first figure looks at some of the key opposing parties listed on multiple petitions. 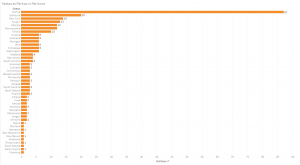 As the listed respondent in 422 of the petitions at the long conference, the United States is clearly the most frequent player in these petitions. Although the United States tends to waive the right to respond to IFP petitions, it has submitted responses in a striking number of such petitions this term (here’s one example). The strategy behind this novel approach of engaging with a greater number of IFP petitions is still unclear. After the United States, several state and federal officials are listed in a large number of petitions. These include prison officials, namely wardens and directors of corrections facilities. Many of the directors of facilities are located in Texas. This connection is logical, because Texas inmates often make up a large fraction of those petitioning decisions to the Supreme Court. Attorney General Jeff Sessions is named on several petitions, and President Donald Trump is the named respondent on two. Although many Texas inmates filed petitions that will be reviewed at the long conference, petitions against several other named states exceed those against Texas. No state comes close to Florida in terms of number of petitions, not even California, New York or Texas. Texas has an asterisk next to it because these 13 petitions are in addition to the petitions against Texas prison officials. Even with the large number of petitions against Florida, another geographic circuit leads the count for the lower courts that gave rise to the various petitions. In the figure below, state names refer to state courts in those states. That circuit, which traditionally is the source of a large fraction of cases on the court’s docket and an even larger number of petitions, is the U.S. Court of Appeals for the 9th Circuit. The U.S. Court of Appeals for the 11th Circuit, which encompasses Florida, ranks third for total petitions. Florida state courts, however, the source of 81 long-conference petitions, far exceed several of the other federal geographic circuits. 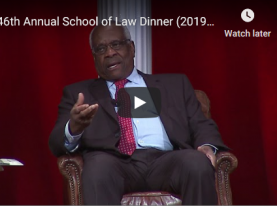 Several of the Supreme Court’s most frequent amicus filers are involved in trying to convince the court to hear petitions examined at the long conference. This figure shows the statistics that are available from CertPool, but these numbers may shift before the long conference. 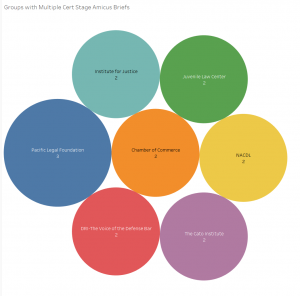 Several groups that tend to file multiple Supreme Court amicus briefs each term, both at the cert stage and on the merits, each filed two cert-stage amicus briefs that were included in the data. 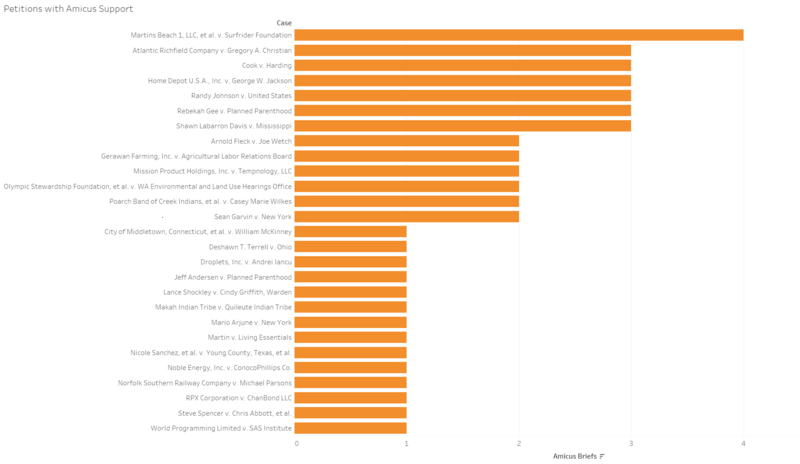 These groups are some of the court’s most effective amicus filers. Only one group, the Pacific Legal Foundation, has three amicus filings in cases that will be examined at the long conference. These filings are in the California beachfront-easement case Martins Beach 1 v. Surfrider Foundation, Fleck v. Wetch, which challenges states’ practices of forcing attorneys to join government-run bar organizations before practicing law in those states, and the arbitration-related case Gerawan Farming v. Agricultural Labor Relations Board. Various other long-conference petitions have amicus support, ranging from one to four amicus briefs. The cases with such support are shown in the figure below. As cert-stage amicus briefs are one of the most efficient means to get the justices and their clerks to pay attention to cert petitions, the cases in this list will likely garner a fair amount of the court’s attention during the long conference. Other markers of petitions that will likely at least get a thorough review from the court include attorneys on the petitions and aspects of the lower court’s decision in the case (especially if the issue in the case is the source of a circuit split). Although the point of delineation between strong and less strong petitions is not always clear, cases with plus factors such as support from elite attorneys are granted at higher rates. 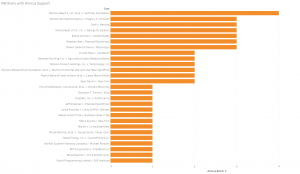 Petitions in 40 cases with attorney or amicus-related plus factors that might help gain the justices’ (and clerks’) attention were aggregated for this post. To gain another source of validity for the importance of these cases, they were cross-referenced with petitions that SCOTUSblog is watching. Thirteen of the 40 petitions, or over 25 percent of the petitions, achieve this convergence validity. The case statements from each of the petitions were retained and run through unsupervised learning software to find topic clusters in multiple salient petitions that will be reviewed at the long conference. Each of the topics could be given titles to help with categorization. Topic 4, for instance, focuses on criminal law, while Topic 6 seems to focus on agency actions. More about these topics can be assessed by locating the petitions that are most strongly associated with each category. 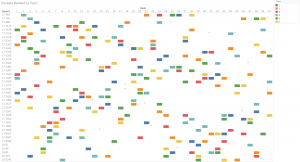 One way to do this is by looking at how strongly each petition is related to a topic relative to all of the other petitions in the set. 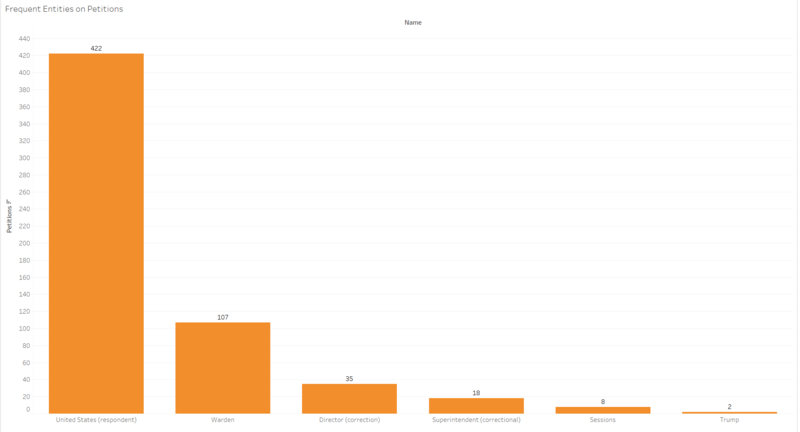 The following figure shows how the 40 petitions line up according to each topic. The dockets are ranked 1-40 from most related to a topic to least related to a topic relative to the 39 other petitions. The top petition in Topic 1 is in Cook v. Harding, which deals with gestational surrogacy and specifically focuses on issue preclusion in a case initially heard by a state court and later heard by a federal court. 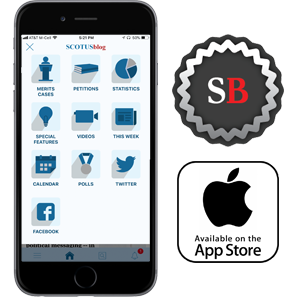 The top petition in Topic 2, which came from the U.S. Court of Appeals for the Federal Circuit and deals with jury damages in patent trials, is Jang v. Boston Scientific. Topic 3’s top petition is Noble Energy v. ConocoPhillips, which deals with contractual obligations in bankruptcy proceedings. The petition in United States v. Herrold tops Topic 4. This case looks at whether certain behavior should be classified as burglary under the Armed Career Criminal Act of 1984. The top petition in Topic 5 is in Martins Beach, which, as noted above, deals with public and private rights of access. Finally, in Topic 6, the top petition is Atlantic Richfield v. Christian. This case looks at common law rights to “restoration” damages at environmental-cleanup sites where the EPA is already involved in the cleanup effort. 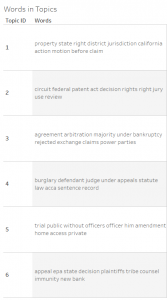 This ranking of petitions according to topic provides a hierarchy of cases but does not show the relative importance of a given topic to a given case. For instance, we might know that case A is stronger on Topic 1 than case B, but this tells us little about how important the topic is to either case, because it only gives order to the set of cases. 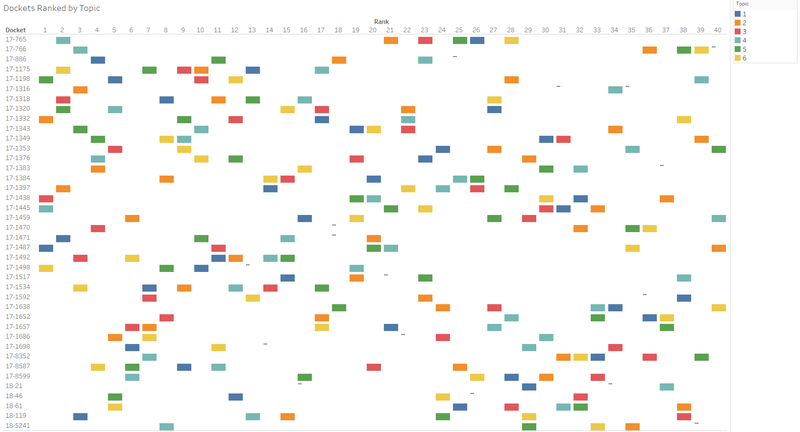 The unsupervised learning output also provides a metric of a document’s relationship to a topic, showing the relative importance of each topic to each petition. 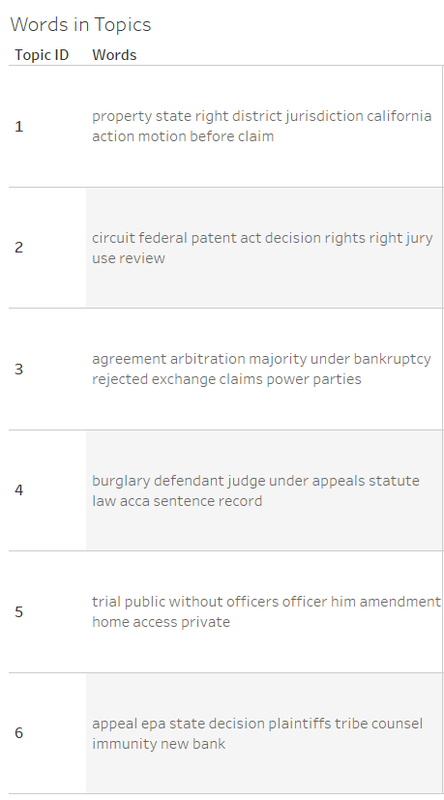 The next figure shows the six petitions most related to each topic and how important each topic is to each of the six cases. 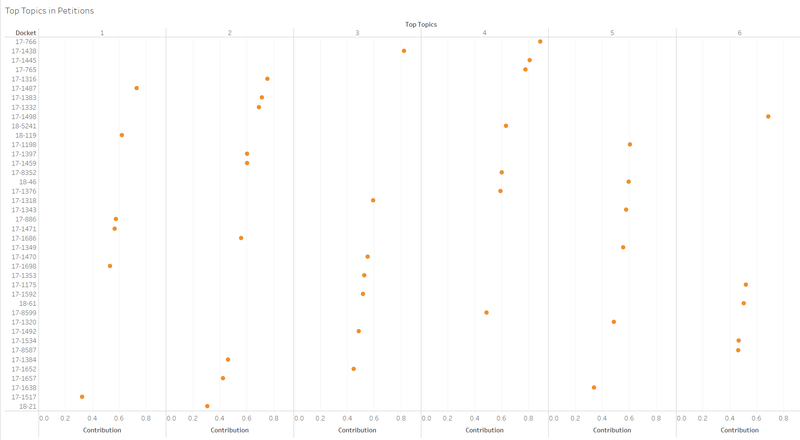 The relative contribution of each topic to each petition is given by a value between zero and one. This figure tells us, for example, that the petition in Noble Energy v. ConocoPhillips is much more heavily related to Topic 3 than any of the other petitions in the set. By contrast, it tells us that the top four petitions under Topic 5 are almost equally related to the topic, so there is not one petition that is particularly distinct in its relationship to Topic 5. Thanks to the Supreme Court’s fairly recent implementation of a service hosting filings on its web server, petitions and briefs are easily available in most cases. If you would like to learn more about any of the 40 cases examined above, you can use the court’s docket search function and then click on any of the hyperlinked documents within the docket.